Vacation rental house. Sleeps 9, 3 bedrooms, 2.5 bathrooms. Dogs allowed. Welcome to Three Coves Hideaway! Are you ready for a campfire in this beautiful waterfront setting?! 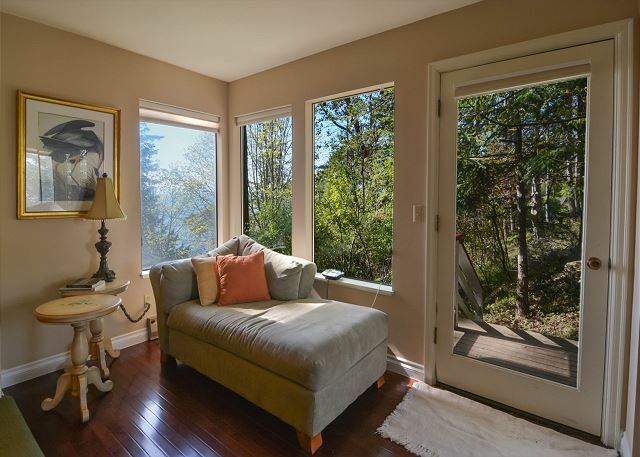 Tucked into the hillside this home looks out over Haro Strait towards Canada. The large deck with new patio furniture and grill make for a great spot to enjoy your vacation. A front row seat to the gorgeous sunsets we have here in the islands. NEW flooring has just been installed in this home! Comfortable living room seating to enjoy. A great room with a staircase that leads to the loft. 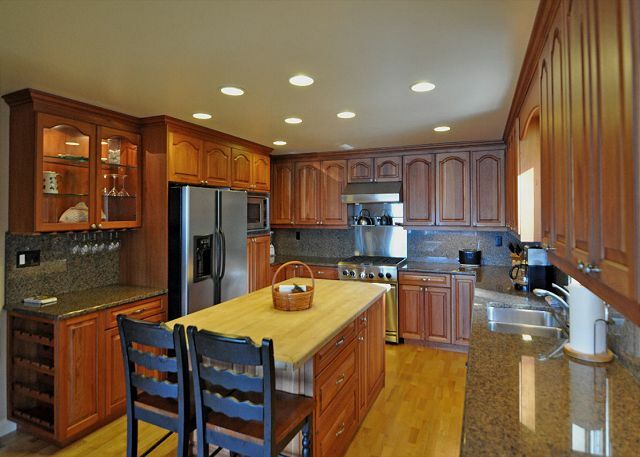 This beautifully upgraded kitchen has high-end appliances and a central island. This large spacious master bedroom features a king size bed. This cozy corner in the master bedroom is perfect for that early riser. Grab a book and settle in while the sun rises. 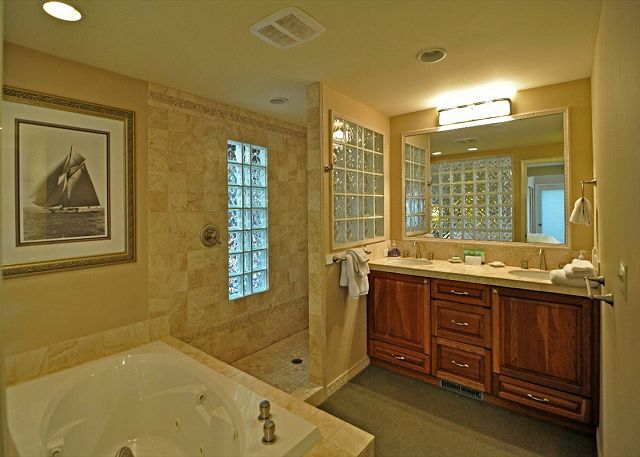 The master bath has both a soaking tub and walk-in shower. 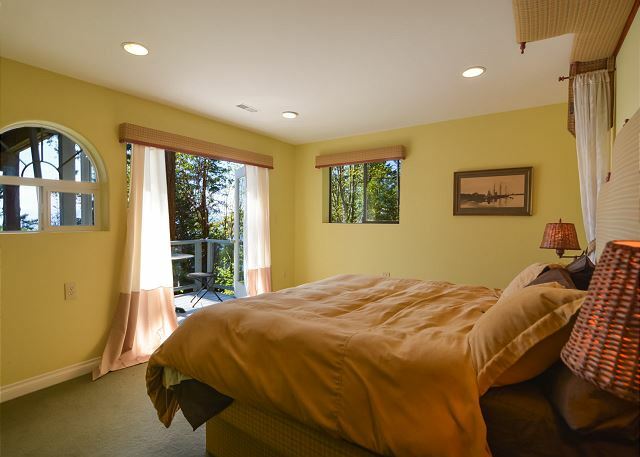 This bedroom also features a king size bed with the addition of a private balcony. A close up view of the private balcony. A second view of the guest room on the lower level. The loft is ready for all kinds of vacation fun! A full size pool table is a great way to have fun and games with the whole family. A second view of the pool table in the loft. The kids will love the Where is Waldo wallpaper in this bedroom that contains two single beds. The lower bath has plenty of room to shower and prepare for another day exploring the islands. Enjoy whale watching and kayaking from this wonderful beach. The deck offers plenty of seating to enjoy the picturesque views. Did we mention this is an ideal place to enjoy sunsets? 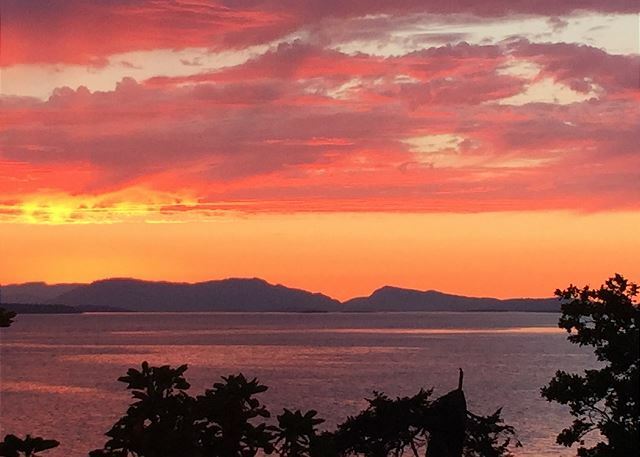 When you stay at Three Coves Hideaway, you’ll enjoy a San Juan Island location that is second to none. The home faces west over Haro Straight, so you will bask in amazing sunsets and have a view of the twinkling lights of Victoria BC at night. Oh, and since you’ll have a front row seat over the migratory route of our resident Orcas whales, it’s very likely that you’ll hear them blowing and be able to watch them doing their whale thing right from your deck! Three Coves is also adjacent to beautiful San Juan County Park, a world-renowned destination for kayaking. A path leads from the property to the park so those so motivated might carry a kayak down a path that leads to the park. (Those less motivated might simply drive a minute or two to the beach.) There is also a path that leads downward to a private cove that is shared with a few nearby residences. Couples and families will find this home spacious and comfortable. The kitchen is a chef’s dream, featuring granite counters, a deluxe gas stove, a large island capped with butcher block, and all the household items you need for meal preparation. The great room includes a dining table, elevated bar table, plush leather seating, a cozy wood-burning fireplace (BYOWood), and window seats focused to the view. The master bedroom is also on this main level, featuring a king size bed and en-suite bath with jetted tub, separate shower, and dual vanities. A powder room is also on this main level. We spent four days and nights here over New Year’s with family who had travelled from Britain and Germany. The kids played at the beach, the adults enjoyed the spectacular views from the huge windows and deck, we cooled festive meals in the large, well-stocked kitchen. The property manager was super helpful and friendly. 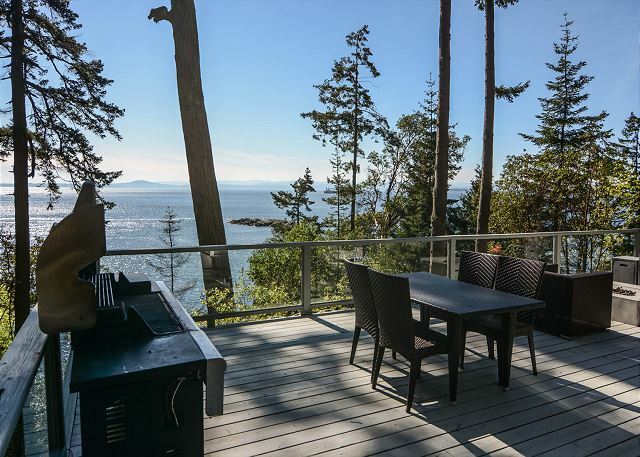 We enjoyed a relaxing vacation at this amazing location overlooking the water and Vancouver Island in the distance. Breezes through the tall fir trees, water lapping on the beach below, the sailboats and fishing boats and kayaks passing by on the water--it was magical! We really enjoyed the house. It had room for a larger family like ours, which can be hard to find. The kitchen was well-stocked with cooking supplies and the right appliances - even a waffle iron! The deck was great - we used it a lot. The only complaint we had was that it was described as having a "private" beach. It wasn't private at all. The beach was shared by the adjacent county park, and park guests used the whole beach. They were polite and the park was not a drawback in any other way, but it wasn't the beach we were hoping for. It was also fairly difficult to get to the beach, making kayaking less enjoyable. If you want a roomy house in a nice setting, this would be a great fit. If you want a nice house with easy beach access that is reasonably private, this might disappoint. This house is perfect for whale watching. We could watch the orcas swim past from our lovely deck. We basically lived on the deck. It has a great grill and good furniture. There are tons of windows looking out on the water. It is away from the touristy feeling area. The house has everything you could need including a surprising number of spices, but could use some updates. The carpet needs to go. It feels a bit greasy and there is a musty smell downstairs. Also, the kitchen is huge, but the enormous island in the middle makes it almost impossible to get past others working in there. If you have pet allergies this is not the house for you. There was a good bit of dog hair in multiple places upon arrival even though the house had just been cleaned. We have pets back home; so, it wasn't a huge deal for us, but maybe a stronger vacuum should be used. House was right where we wanted to stay, on the west side. It had everything, great views, privacy, and wildlife. The house at Three Coves was great! We loved the location, and having breakfast and lunch looking out onto the water. Pam was very helpful and checked in with us often. I’d definitely come back. It's hard to imagine there could be a home on the island with a more spectacular view! If we were at the house, we were outside on the deck enjoying the view, enjoying a glass of San Juan wine, watching a harbor seal in the cove below us, dolphins, ships & sailboats passing, deer roaming all around the house. Even after dark, we sat outside & enjoyed a sky full of stars and ships passing silently in the dark. There was an island burn ban in effect, so we were unable to use the lower firepit or the deck firepit. Would have been lovely on chilly evenings. The top two floors of the home are gorgeous. The lower floor is in need of a paint job and new carpet (or at least a thorough carpet was dirty! ), but the bed was very comfortable. Clearly, the home is a work in progress...the first two floors are completed and the lower floor is next. There were a few items in disrepair (icemaker, deck umbrella, trash compactor, warming oven)...just minor inconveniences. We enjoyed every moment in this home and are already planning our next stay. I am Canadian and loved looking across Haro Strait to Vancouver Island. We fell in love with this island and cannot wait to return! 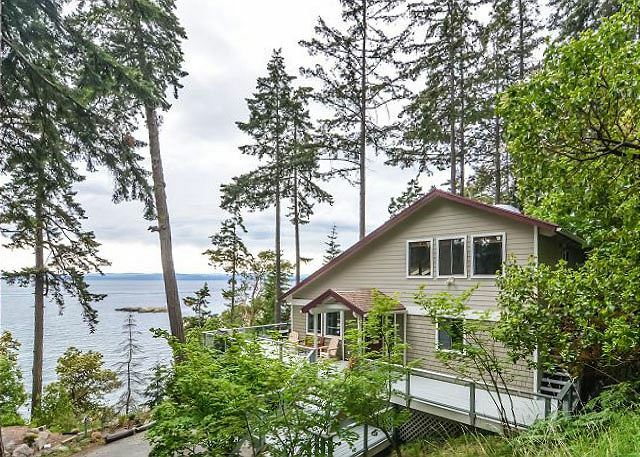 This home has a gorgeous view of the Haro Strait with beach access. It was great to store our kayaks down there for the ease of going out and returning, and it is a short distance to Lime Kiln with it's often abundance of marine animals. 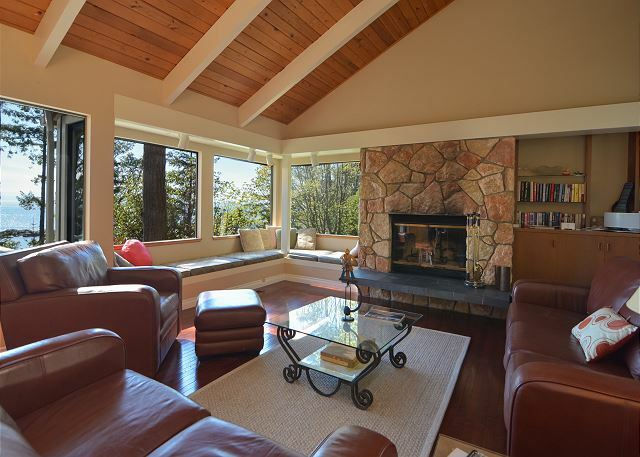 It has a good layout for a large group, large kitchen and great room, expansive deck. It does need someone in the management to go through and identify things that need fixing. Also it was clear the carpeting needed cleaning. Otherwise a wonderful San Juan house. The house had great space for a family get together with a large dining table that fit 8 people, many sitting spaces to relax and play games and a pool table. The deck had a fire place along with a fire pit that over looked the water with a great view of a Wildlife Refuge for animals mostly birds. Had a great time on the island and the house was perfect for our family celebration. I couldn't have asked for a more perfect house and location for our family reunion. We had an amazing family vacation at 3 Coves Hideaway #111. The house and location were perfect. We loved the views; saw whales from the deck. Gathering on the deck was our favorite spot; wasn't sure we would spend time in the house at all until it rained and then we enjoyed hanging out together in the spacious living room and playing pool in the loft. Definitely recommend this house; loved our time on the San Juan Island and coming back to the house to recharge for the next excursion! All family members agreed it was the perfect Smithcation location. A great time was had by all!!! Wonderful! Can't wait to come back! We spent four wonderful nights on San Juan Island at Three Coves near San Juan County Park. Having spent many summers camping at San Juan County Park this location has a special place in our hearts. Finding a house so close to the park on this side of the island was such a fantastic surprise! The house was so spacious and the property was beautiful to explore. We hope to visit again someday! We had a few small issues but wanted to alert you to them simply for the benefit of you having the information. -We found a few soiled cooking dishes in the cupboard when we went to use them. We washed and returned them but thought you would want to know. -Also, there is a large yellow jacket nest on the path going down to the beach - it's on the left side just after you turn the corner and start the descent. -An incredibly large tree spider came visiting from under the dishwasher. After much jumping and screaming we did manage to kill and dispose of it. -Being allergic to feathers caused a bit of a problem but in hindsight we should have asked about down pillows and comforters. -Knowing ahead of time we could not wear shoes in the house would have been helpful as we would have brought inside only slippers. I don't recall seeing that in the information we received. Our family had a wonderful time celebrating a 70th birthday and a 45th wedding anniversary. The weather was perfect which allowed us to use the spacious deck area to gather and to eat. The deck was also a place to spot whales and watch all types of water craft passing by. A short hike below the house is a nice gravel beach. We were able to launch a small motor boat less than a 1/4 mile away at a public park. The property was accurately described. The kitchen was well equipped although a bit crowded due to the large island. 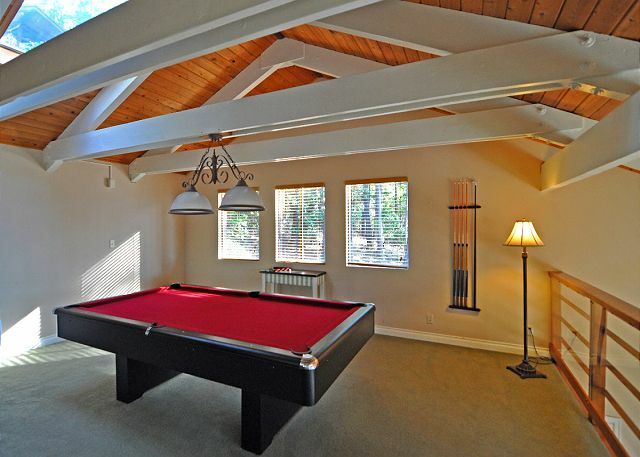 The loft area was great for playing pool or watching TV. There was a variety of bedroom sizes and plenty of bathrooms that were well supplied. We had a memorable 4 days at Three Coves and would love to go back again. Made us feel like we lived there! Great 4 days. We had 2 families and grandma (8 people). This place is very livable for a group size of around 8. We were able to move in quickly, make meals easily, have enough room to take a break from each other from time to time and have periodic personal whale shows from the deck. Quiet at night with relaxing breezes coming in windows. Great view and location to enjoy the San Juans. Deer stop by, see the Orcas come by. Beds very comfortable and the house is well stocked. This location was smack between Roche and Friday Harbors so we could easily go to one or the other. The water in front of us provided views of the Orcas every day we were there! House was perfect for the family. We had stayed on San Juan Island last year and really looked forward to this year's longer stay. This home was everything we had hoped it would be. Sitting on the deck overlooking the Haro Strait watching boats, otters, seals, Eagles and orcas every day couldn't have been better. Oh, and the sunsets were spectacular! There are some oddities about the house, but nothing that we couldn't overlook. San Juan Vacations was easy to work with and checked in with us upon arrival to make sure all was good. Every rental situations has elements that could be improved, but in our case, the problems were so minor that they aren't worth mentioning. When planning our next visit to the area, our first call will be to SJVV. 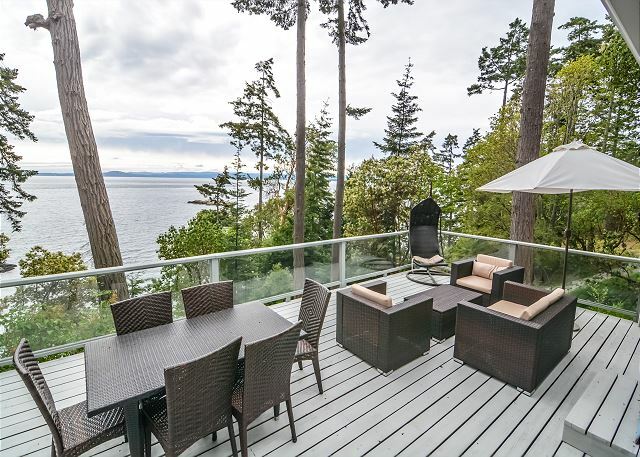 the property had a pristine view of the Pugent Sound with Victoria, BC in the distance. It was nice to be away from the 'hustle & bustle". The kitchen was very well stocked. The Management company was absolutely the BEST , so helpful with many suggestions of activities, and contact people, even a restaurant suggestion which was 'amazing'. There was a campground next to our home through the trees, but really did not prove to be a problem. As far as the home, it was 'pricey', particularly for 7 days. Because of the wide kitchen island, it was difficult to open the refrigerator, if a a person was 'large', it would prove to be a tight squeeze. The pool table was an absolute 'hit' with our kids, 21, 22, and 23. 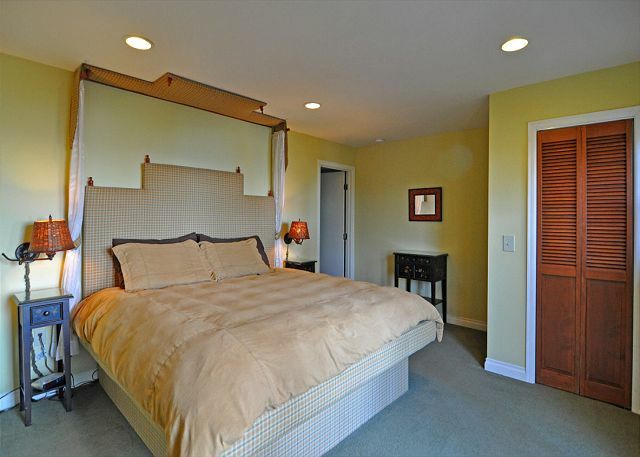 The master bedroom is very nice, as well as the 2nd bedroom with the queen bed. The 3rd bedroom, in comparison with the double, and twin bed, looked almost to be 'left overs'. With investing a small amount of time, and decor, this could be much more appealing, without the 3rd party feeling as if they were almost punished by having to be in this room. Also, in the heat of the summer, the front room becomes extremely warm. There needs to be more than one fan. And although, the view is the best feature, possibly some window treatment to block some heat, instead of some thin sheats on outer sides of the room only. Otherwise, a wonderful time spent there. Such great memories. 5 gold stars and more to your excellent staff-stellar, very informed, friendly, professional, and courteous!!!! The most beautiful sunsets from the deck!!!!!! Thank you, thank you for the staff cudos! The view was the most impressive thing about the rental. We saw whales several times from the deck. We also saw deer, foxes, and bald eagles. The house itself was alright. It needs a new screen door. Current one falls off the tracks everytime it is used. When it is "closed",it still leaves a 2 inch gap for insects to come in. It is also very noisy there since it is right next to a state campground with lots of kids screaming. The house and location were perfect. We enjoyed all the amenities found in the house. We even saw Orca whales and seals from the deck! The three couples who stayed there said it was perfect! Although we were lucky enough to be part of history when the car loader/unloader from the ferry went on the fritz and we had to leave the rental van behind, it was a blessing in disguise. After we got groceries, we just stayed in the house enjoying the view, fireplace, pool table and being with our family. It was the perfect weekend. Laura, from Vacation Doorways, informed us about the ferry problems before we got to Anacortes and gave us the options. She even met us on the dock! Ken, from Bob's taxi service, was full of info and patient with our needing to get provisions. We had a great weekend! We really appreciate your understanding thee unusual ferry troubles and your great attitude about making lemonade out of lemons! So glad that you had a enjoyed this time with the family and in the San Juan Islands. We stayed for two weeks, had a wonderful time, the house was nice,we rented this house for it's location, and view, we had issues with bees on the patio, both my husband and myself were stung several times. They were taken care of after we called the property management, but it did take a few days as part of our stay was on a holiday weekend. The other thing was mice, we had to keep all food in the fridge. Overall we enjoyed our stay and would stay again, but would inquire about the mouse problem before deciding. 12 pm or even an 11am check out time would have made the trip a lot nicer- we felt very rushed. Overall I loved this place and would go back- I have even already recommended it to a friend. Thank you! The house was exceptionally clean and very comfortable for the seven of us, including a teen and a 7 year old. We loved the deer visiting at least once every day and the orcas passed by almost every day and we got a kick out of the Westside Free Pile, too bad someone burned it. We loved the fresh vegetable stands, the alpaca farm, the lavender farm, the beach, the Lime Kiln Lighthouse and everything the island had to offer. We loved the house and its location. We just couldn't find a tongs to cook bacon with. We couldn't find a tongs in any store on the island, so now we understand. We can't wait for an opportunity to return! Awesome house! Beautiful setting, lots of room, good lay out. We had nine people, two teens and one younger kid so the loft and the twin bed downstairs worked out nicely. Deck railing looks sketchy other than that a fabulous house. New pans and knives are on the way. Thanks for bringing this to our attention. The view was fantastic. The downstairs bedrooms were damp-smelling, especially the room at the back that only had 1 window. There was a mouse in the kitchen and lots of droppings in lower cabinets and under the sink. Sorry about Mickey! We do live very close to nature in the Islands and a nice warm house often attracts otters, raccoons, & mice. We are addressing the recent visits and scents. This is the best vacation rental I've ever stayed in! We loved the view, location, and all the amenities available at the house. It was spacious so everyone could find their place to hang out and relax. Played some pool, use the available printer for plane tickets, and found our way around the gourmet kitchen(we expected a bit more from that but still enjoyed). We'd stay there again in a heartbeat. We had the most wonderful time at this home. Every aspect was great. The view was amazing (we saw 15 whales on the 1st day), the house was clean and cozy, the beds were so comfortable and the kitchen had everything you needed. We were there with our 5 kids under 5 and the house was perfect for them as well. The management company was fantastic. They were so helpful, genuine and kind. I look forward to coming back to this house again. The only thing I would change is that we would stay longer next time. I did not want to leave. Thank you for everything! Thank you Heather. We scheduled the whale show just for you! Windermere was wonderful and very easy to book with. The property is beautiful,in a spectacular location(view,view,view)! I cannot say enough. All I have to say is I woke up and watched orcas swimming past while I sipped my coffee. The people in Friday Harbor are kind and the location is truly a hidden gem. Everything was great except the kitchen equipment. The pots and pans are horrible. The dishes, bowls, platters were extremely limited. The knives were dull and cheap. The whole kitchen experience was a D-, in contrast to the excellent experience in the rest of the house. New pans, knives, and plates are on the way.! Great place, we had a fabulous time. May want to get an exterminator, there were lots of spiders inside the house. Our family truly enjoyed this beautiful home. Overall it was very comfortable and well-furnished. The view of the Haro Strait from the deck is amazing, we saw seals almost every day and the orcas visited 3 or 4 times during our week stay. Mama deer and kids, and Little Black Fox came by daily. Even though this home is next to the county campground, it was still quiet and relaxing. Our wonderful sunset kayak trip launched from the campground, so we merely had to walk over. There were a few minor maintenance and cleaning issues that we notified the agency about upon leaving, so hopefully they will be resolved soon. 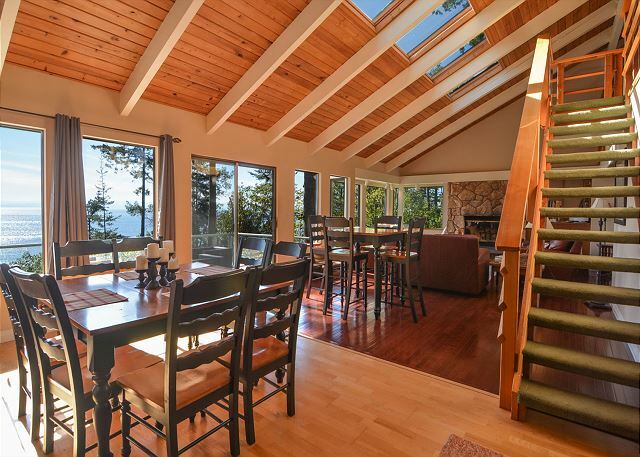 We will recommend this property to our friends and will definitely reserve again for future trips to San Juan Island. The BBQ has been replaced. 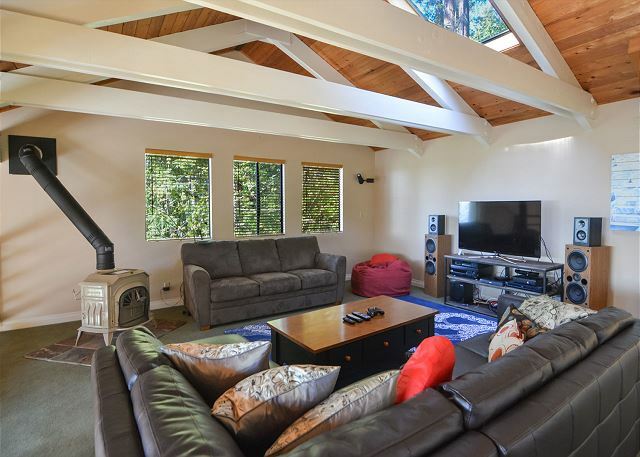 This house is in a great location, with great views and close to Lime Kiln State Park--a prime whale watching spot and a great spot for low tide tours in Dead Man's Cove. The house is on property located right next to San Juan County Park & Campground. The beach is semi-private as you share it with the campground. This home is in need of some maintenance--such as a new screen door and windows that need replaced due to "fogging". The kitchen has great appliances but lacks somewhat in the area of quality and condition of utensils--broken cutting board, etc. The lighting in the home at night is not for those over 40. They were not an issue for us, but there are a lot of stairs to enter the home and if you are using the lower and upper levels of the home--more stairs. The master bedroom & bath on the main level are beautiful; the "master" bedroom downstairs does not have its own bathroom, but shares with the other bedroom downstairs. We saw whales from the deck, deer, eagles and fox all on the property during our early June stay. There were six in our party--three adults and three children, ages 10, 7 & 5. We were very pleased with the staff at Windermere SJI and the house at Three Coves Hideaway #11. We already have recommended the Three Coves Hidwaway #1 to a number of our friends. So many whales, loving being on the west side so close to Lime Kiln. So much nature on the property. Great place for families. The kids had a great time! This rental was perfect for our group! The place was clean, the view was awesome and the layout was perfect. We really loved this property and it was more than we imagined it to be. Beautiful view on the west side of the island. 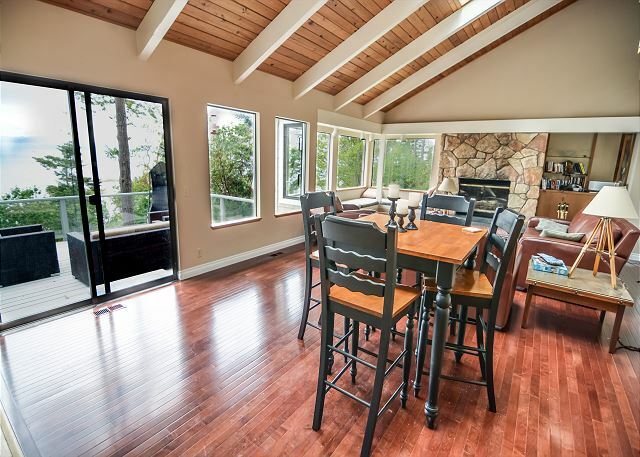 Centrally located to Friday Harbor, Snug Harbor, and all the points of interest you could ask for. Definitely would rent this property again. Highly reccomend it to anyone. This property was a very relaxing place to be with wonderful views of the water. our deck. It was clean and well equipped. Our recent stay at three Coves Hideaway #11 was very enjoyable. We enjoyed teh nearby San Juan County Park and went down onto the private beach area to look for ocean life on the nearby rocks. We had 5 deer mingling in the drive or munching on nearby shrubbery. We also fec them apples and carrots. We snjoyed having the hummingbirds drinking from the netar supply on the deck and had an occasional fox come by also. The ocean traffic coming through Haro Strait was worth the view from the deck as well. Overall, it was a very pleasant week and we are anxiously waiting to return again next Spring Break. Why Spring Break?? 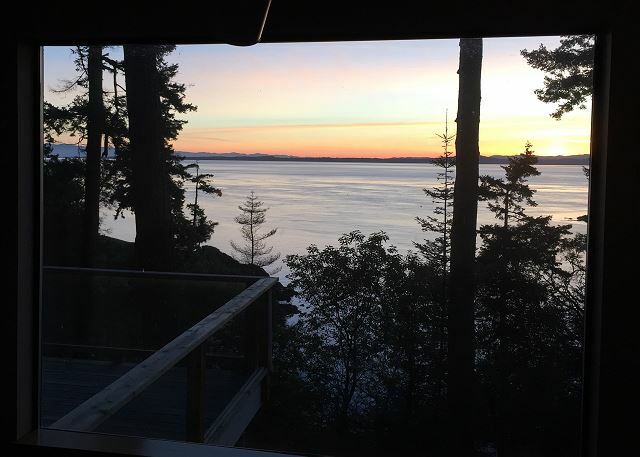 My wife is a teacher and the time away from our real home is needed and spending the week in the San Juan Islands is our Annual Spring getaway. We hope to stay at Three Coves Hideaway #11 again next near!! Thaks for a grest week!!! We have rented Three Coves Hideaway for the second time. The location is ideal and the home is more than adequate for family gatherings. The sunsets and opportunities for photography are excellent and with the County Park next door there is room to explore and roam. I would say this is a great place for families with adult children and teens. Our stay was perfect and the location was perfect. Secluded and spectacular views and to top it off the weather gorgeous. The fact that we could stay a part of the week after being at Mt Baker made a wonderful vacation.